The presentations for last month's meeting of NASA's Outer Planets Assessment Group (OPAG) were posted online last week. The focus of the meeting, which took place on February 8 and 9, was the president's NASA budget for FY2011 and the projected budgets over the next few years, and the Europa/Jupiter System Mission (EJSM). In the first day of the meeting, the presenters focused on the new NASA budget and the ongoing, planetary science decadal survey. James Green and Curt Niebur, both from NASA Headquarters, presented on the new budget and how it impacts ongoing and upcoming outer planet missions. Green made it clear that NASA's Planetary Science Division was committed to funding EJSM through at least pre-phase A, and the budget reflects that. NASA will then look to the new decadal survey for how to proceed with flagship mission program. Personally, I don't see why they need to wait, the flagship mission was selected competitively. I don't see why we need to go through this non-sense again. These issues won't effect budgets until the out-years in the current budget projections... Anyways, Green also reported that funding for the restart of Pu-238 production is back on track now that NASA and the Department of Energy have developed a plan outline the "role and contribution of major users of Pu-238", as requested by Congress last year after nulling out such restart funding in last year's budget. Niebur's presentation provides a breakdown of planned funding for EJSM in the president's budget: "FY11: $20M, FY12: $72M, FY13: $64M, FY$14: $53M, FY15: $63M." This is fine for phase pre-A and A, but as we get passed instrument selection from the AO, those budgets should be going up not down, as seen now in FY13, FY14, and FY15, if a 2020 launch is still planned for. John Spencer's presentation on the satellites part of the decadal survey showed a series of mission concepts that are being evaluated inclusion in the survey, including a New Frontiers-class Io Observer. 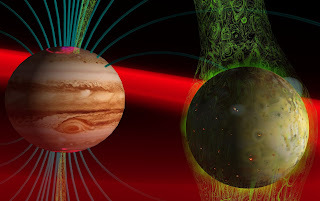 The Europa/Jupiter System Mission presentations from the meeting's second day provide additional details on cooperative observations by the two spacecraft of the mission. For example, they plan to use a radio link between the Jupiter Europa Orbiter and the Jupiter Ganymede Orbiter to probe the upper atmosphere of Jupiter. I will post more on the EJSM presentations tomorrow. I am rather surprised to find that in the two years I have had this little slice of the internet, not once have I written a post discussion the name sake for this blog, Gish Bar Patera, except for the post earlier this week presenting a version of the above image. So, tonight, I thought I would provide a discussion of the geology of this volcano and the volcanic activity observed there. Much of this description is based on an abstract for a poster I presented at LPSC in 2003. However, this post does include some new science as I included NIMS data from August 2001 (I31) in this analysis, whose data at 1.1 microns allows for reasonable comparisons with the Galileo's cameras visible data (providing further evidence that the flow seen in October 2001 formed after the August 2001 flyby, which was only inferred in my abstract). I've also provide a better description of the Galileo nominal mission data, which provides additional weight to my arguments about changes at Gish Bar between July and October 2001 (there was some debate at the time about these changes being due to phase angle effects). Gish Bar Patera is a volcanic depression located on Io's leading hemisphere at 16.2° North, 90.3° West. The depression has an irregular shaped, as wide as 146 kilometers (91 miles) in the north-south direction and 131 kilometers (81 miles) in the east-west direction. The margins of the patera present signs of terracing along the patera walls as well as multiple floor levels, suggesting either multiple collapse events (akin to the volcanic crater atop Olympus Mons) or post-formation mass wasting of the patera wall and several volcanic sills, respectively. Compared to Chaac Patera, a volcano discussed here in January, Gish Bar is a shallower depression, with a floor only 500 meters below the surrounding plains. 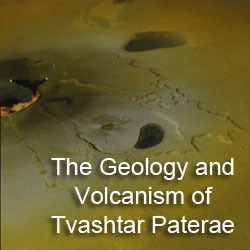 Volcanism on the floor of the patera is focused in two areas: a large flow field in the north, west, and central portions of the volcano to the northwest and a possible lava lake within the southeast portion of the patera. The flow field consists of multiple flow lobes, suggesting that this portion of the patera consists of a compound flow field similar to Amirani. These flow lobes have different albedos and colors, suggesting a spectrum of surface ages or possibly different compositions. A bright orange flow in the northern potion of the patera is a possible sulfur lava flow. The other flows are consistent with the deposition of sulfur and sulfur dioxide on a cooling lava crusts of different ages. As we shall see a little later, dark, fresh flows have been observed in this flow field from orbit to orbit, while older flows fade. The southeastern end of the patera consists of a possible lava lake, 62 by 25 kilometers (38 by 16 miles) in size, with evidence for overflow events from three lava flows exterior to it. The sharp boundaries of this area suggests topographic control for the material in it, consistent with the lava lake interpretation. To the north of Gish Bar Patera is an 11-km (36,000-foot) tall mountain named Gish Bar Mons. Gish Bar Patera and the volcano north of the mountain, Estan Patera, both appear to have led to increased mass wasting on the north and south sides of the structure. Despite this, very little debris from the mountain is apparent in the northern end of Gish Bar Patera. However, large landslides are visible to the west of the mountain, suggesting at least some degradation as the top layers of the shallow-sloped side of it sloughed off. Volcanic activity was first observed at Gish Bar Patera in the form of a thermal hotspot by the NIMS instrument during Galileo's first orbit on June 26, 1996 (orbit G1). It was also observed as a low-intensity, near-infrared hotspot in November 1996 (C3) and September 1997 (C10). 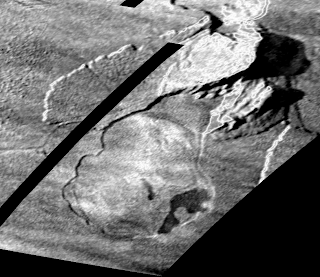 Perhaps the most intense eruption of Gish Bar Patera during Galileo's nominal mission occurred in December 1996 (E4), when the SSI camera observed an intense hotspot at the volcano in an observation of Io while the moon was in the shadow of Jupiter. Jani Radebaugh, for her dissertation, correlated Galileo's eclipse observations with Io's surface features. Assuming the twist angle of the camera is correct, her E4 results suggest that the southwestern and central portions of the patera were the source of the eruption. E4 and later C10 sunlit images revealed small, dark flows in these areas, though it is possible they predate the December 1996 eruption as no images with sufficient resolution to resolve them exist before it. The next Gish Bar imaging opportunity for Galileo was during the C21 non-targeted encounter on July 2, 1999. Gish Bar was imaged in three-colors at a resolution of 2.6 km/pixel in the violet and IR-756 filters and 1.3 km/pixel for the green filter (used in the graphic above). No surface changes are clear in the C21 data (compared to the clear-filter frame taken almost two years earlier), except for a new dark spot on the eastern wall of the southeastern "sub-patera". This is consistent with the lack of observed thermal activity at Gish Bar between September 1997 and July 1999. 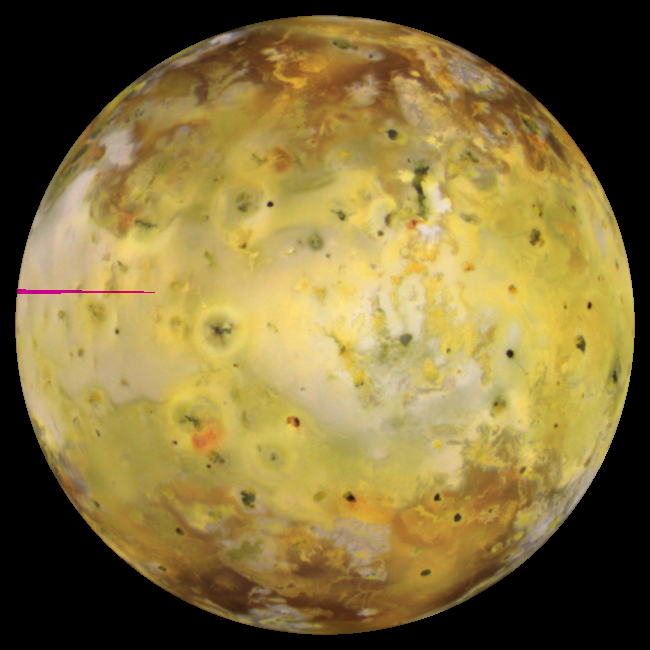 In late 1999, Galileo flew by Io twice, on October 11 then on November 25. 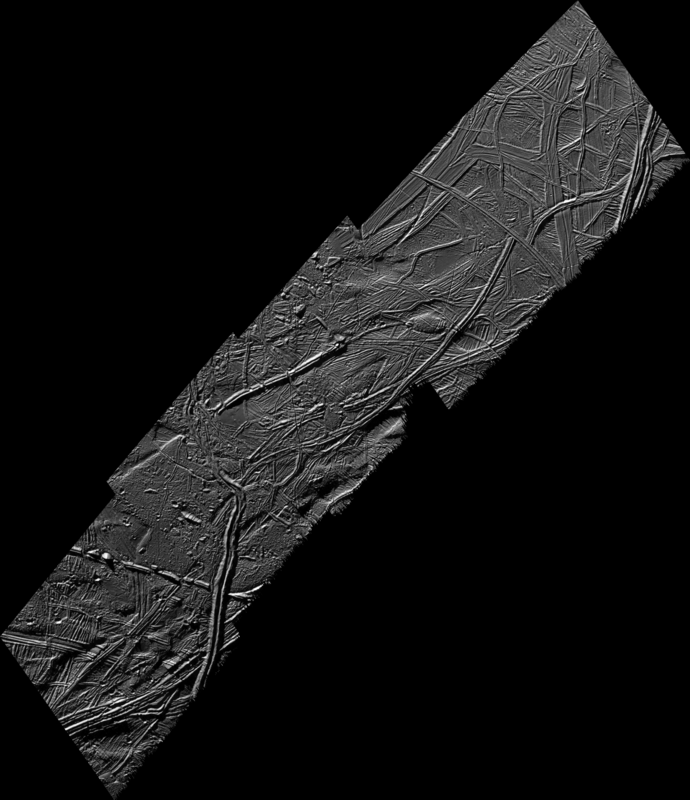 During the October flyby (I24), Galileo observed Gish Bar at 500 meters per pixel, shown above at full-resolution in the Geology section above. Two notable changes, shown in the ratio image at right, had occurred at Gish Bar Patera between the July and October 1999. Much of the southeastern "sub-patera" had darkened except for a small "island" area. Within the flow field in the center of the patera, a fresh, 22-kilometer long, 3-kilometer wide, lava flow was also visible. A possible origin for this fresh lava was an outburst eruption that occurred on August 2, 1999. However, the low spatial resolution of the available ground-based data makes it difficult to assign a specific volcano to the eruption. Within the Galileo AMSKGI01 mosaic, no other major changes are visible that would be consistent with such a major eruption, but the terrain to the east of Gish Bar was not covered in October 1999 to provide additional comparisons with the pre-eruption images from C21. However, the amount of fresh lava covering the floor of the lava lake (or "sub-patera") and the new flow lobe would be consistent with such a major outburst. Gish Bar was observed again by Galileo during a pair of flybys in 2001, on August 6 (I31) and October 16 (I32). 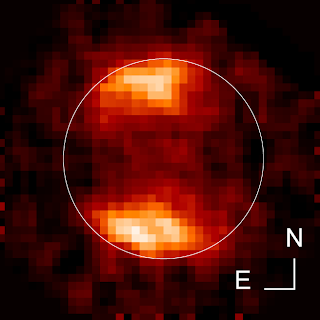 While high-resolution camera images were not obtained in the August flyby due to a camera malfunction, the near-infrared spectrometer acquired an observation of Gish Bar with a resolution of approximately 7.3 kilometers per pixel. This data revealed thermal emission within the lava lake and across parts of the flow field. However, most of the emission was at longer wavelengths, consistent with cooled lava flows. The shorter wavelength data provides the highest resolution data of the volcano between October 1999 and October 2001. No surface changes are apparent, though it would appear that many of the flows on the floor of Gish Bar had faded since October 1999. Two months later, Galileo's camera observed Gish Bar once again, this time at 250 meters per pixel. A fresh lava flow, 1430 square kilometers in size, was visible across much of the western half of the patera. This covered much of the green colored terrain seen in the C21 color data. The flows seen in the center of the patera in the C21 and I24 data had faded due to inactivity and later sulfur deposition as the flows cooled. The lava lake was still covered mostly with dark material, suggesting continued activity after October 1999. The fresh lava flow observed at Gish Bar is thought to have formed sometime after the August 2001 flyby, as a significant increase (two orders of magnitude in emitted power) in Gish Bar's thermal emission was observed by NIMS during the I32 flyby, and the flow was not seen in the NIMS short-wavelength data in August. Assuming the eruption started shortly after the I31 flyby, the average coverage rate for the eruption was 230 square meters per second, similar to the coverage rate inferred for the Pillan eruption in 1997 or twice Kilauea's coverage rate at its peak. This was a major eruption indeed! Marchis et al. detected a hotspot using the Keck telescope in December 2001, showing that the eruption continued at least another couple of months. Gish Bar Patera displays some fairly unique behavior for a volcanic depression. The patera itself is one of the largest on Io, large enough to have different portions of the volcano display different eruption styles. The southeastern potion of Gish Bar appears to consist of a large lava lake. Much of the rest of the patera floor is covered by a lava flow field, not unlike Amirani or Prometheus, that is topographically confined by the walls of the patera. The flow field is built up by multiple flow lobes, that form during major eruptions that occur every few years. Thus, unlike Amirani and Prometheus, Gish Bar is not persistently active. 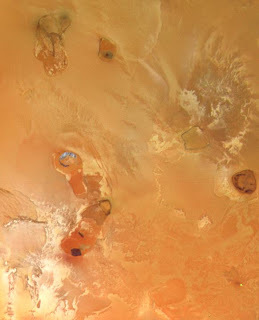 Its multi-colored surface and the adjacent mountain, Gish Bar Mons, make this region a compact version of many of the geologic themes that are common on Io. It certainly makes it one of the most fascinating features on Io, and that's why I presented a poster about it seven years ago, and that's why I named my Io blog after it. The Discovery Channel's Space News blog is hosting this week's Carnival of Space, the 144th edition. Ian O'Neill went with an Oscar theme this time around (can't imaging why...). The Carnival of Space presents the best posts across the span of space-related blogs. So don't forget to check it out and get caught up on the latest news! 15ESREGMAP01 - This mosaic covers the terrain north from the 17ESREGMAP01 mosaic presented yesterday. 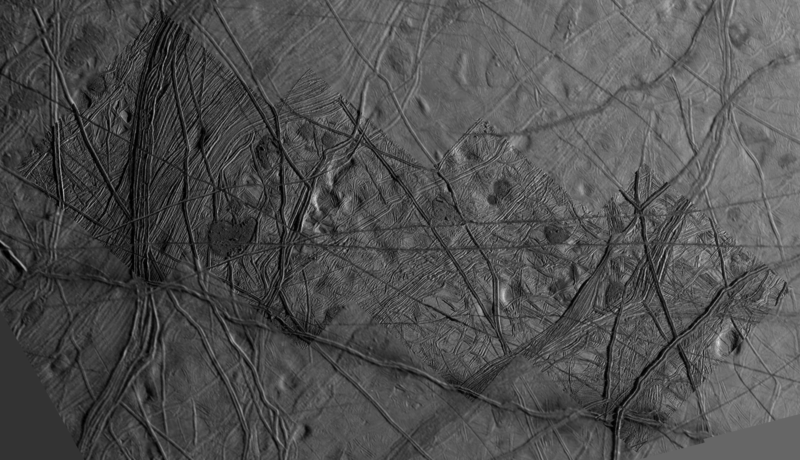 This mosaic runs from Mehen Linea in the top frame, across the intersection of Minos and Udaeus Lineae, and finally to the lenticulated terrain northwest of Dyfed Regio. A portion of the middle of this mosaic was covered by the higher resolution mosaic, 19ESRHADAM01. This mosaic has a resolution of 228 meters per pixel. 15ESREGMAP02 - This mosaic covers the terrain north from the 17ESREGMAP02 mosaic presented yesterday. This mosaic covers the famous, mitten-shaped chaos region, Murias Chaos as well as two good sized impact craters, Brigid (three quarters of the way down) and Maeve (in the top frame). That's it. No more. I am done with Europa. I need a shower. I feel unclean now. Just because Europa (or her publicist) on Facebook asked nicely, I present the following mosaic, 19ESRHADAM01. 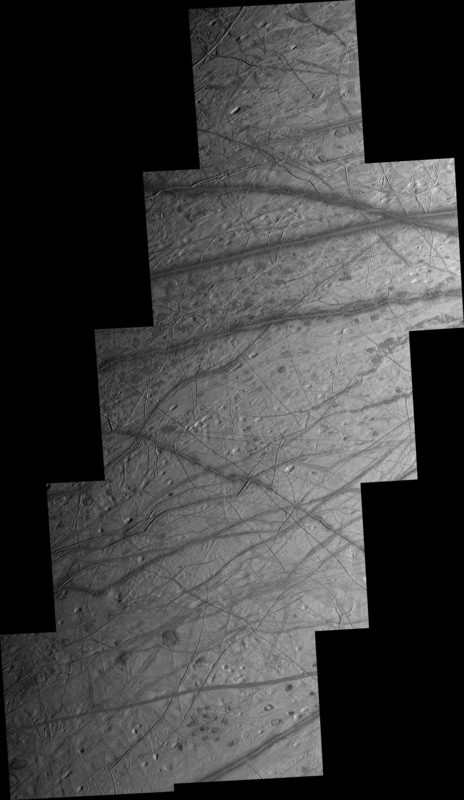 This four-frame mosaic was taken on February 1, 1999 and was intended to cover a portion of Rhadamanthys Linea, a double-ridge on Europa's northern anti-Jupiter hemisphere. 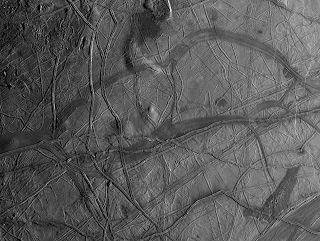 The view at right is just southwest of the prominent intersections of Udeaeus, Minos, and Cadmus Lineae. Clicking on the image at right will take you to a smaller version of the image, or you can download the full-resolution version by clicking here [3.57 MB PNG image]. The full-resolution version has a pixel scale of 62 meters per pixel and is centered near 35° N, 225° W. The two background frames come from the 15ESREGMAP01 mosaic. The target of the mosaic was Rhadamanthys Linea, which runs left-to-right in the bottom half of the image, was only covered by the bottom corners of the four frames. This mosaic instead, highlights a region of lenticulated terrain. Lenticulae are region of small chaos or depressions on Europa surface, often appearing darker than the surrounding terrain. Many of these dark chaos regions disrupt or destroy the pre-existing ridged terrain, like the two-lobed dark area in the second frame from the left. Another disruptive feature is a fracture that runs through all four frames from left to right, that cuts into pre-existing ridges. 17ESREGMAP01 - 233 meter per pixel mosaic of a north-south strip centered around 210° West, running south from around 15° N to 65° S Latitude. The mosaic covers portions of Belus Linea near the top of the mosaic, runs south covering Castalia Macula and portions of Argadnel Regio, then finishes up over portions of Onga, Katreus, Agenor, and Astypalaea Lineae. 17ESAGENOR03 - 46 meter per pixel mosaic across portions of Agenor Linea. This includes the western seven frames out of ten due to a gap in the mosaic. 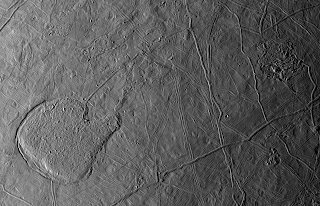 17ESSOUTHP01 - 43 meter per pixel mosaic across portions of the south polar region of Europa near 79° S, 128° W.
17ESREGMAP02 - 211 meter per pixel mosaic of a north-south strip centered around 77° West, running sourth from around the equator to the limb near the south pole. 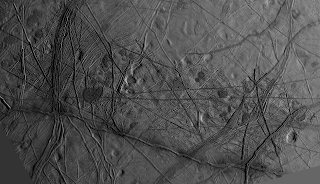 The mosaic covers portions of Euphemus Linear near the top of the mosaic, across an area of chaotic terrain on Europa's leading hemisphere, south to a series of ridges (such as Sarpedon Linea). Several impact craters are visible, including: Cliodhna (middle top), Uaithne (fresh crater on top of a dark ridge about three quarters of the way down), and Grainne (larger crater in bottom left frame). Last week, I posted a new version of the global color mosaic the Galileo spacecraft acquired in July 1999. This week we take a look at a mosaic from a Galileo flyby in October 2001 of the blog namesake, the volcano Gish Bar Patera (right frame), and the terrain to the west of it. The mosaic has a resolution of 267 meters per pixel and is centered near 17° N, 95° W. In this version, I have combined the brightness information from the three frame mosaic (32ISGSHBAR01) with the color data from the C21 mosaic from July 1999. Be sure to DOWNLOAD [3.56 MB PNG image] the full-resolution version (Blogger automatically shrinks the version linked above). A few things of note in this color mosaic. First, in the two years between the time the color data was taken and the higher resolution clear filter mosaic, several volcanic eruptions and other surface changes occurred at Gish Bar. Between July and October 1999, the southeastern portion of the patera darkened, possibly due to a major eruption in August that year. 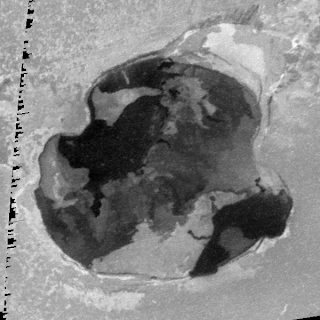 During the October 2001 flyby, Gish Bar was undergoing another major eruption, which likely generated the dark flow on the western side of the patera. Some of the dark flows seen in the July 1999 data have since brightened, which appear purple-ish in this mosaic. As a result of the surface changes, some of the colors seen in the patera should probably taken with a grain of salt, which is why I preferred not to do this before. Outside of Gish Bar Patera, the terrain is mostly yellowish, with a few key variations seen. 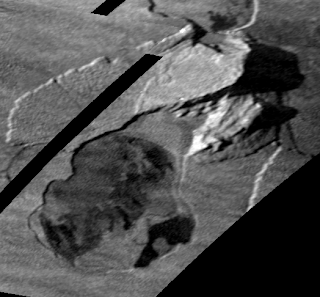 For example, the mountain Monan Mons, the southern portion of which is seen in the left frame, has bright material across much of the debris deposits to the east of it, suggesting that sapping of sulfur dioxide within the mountain may have played a role in the degradation of that structures. There also appear to be color differences between the bright yellow plateau to the west of Gish Bar (seen in the middle frame with the Y-shaped dark fracture running down the middle of it) and the surrounding, greenish plains. Another day, another Io atmosphere paper. Today, we take a look at a paper by Arielle Moullet, Mark A. Gurwell, Emmanuel Lellouch, and Raphaël Moreno titled, "Simultaneous mapping of SO2, SO, NaCl in Io’s atmosphere with the Submillimeter Array." This paper was posted online Thursday in the Papers in Press section of the journal Icarus. In press papers are articles which have gone through peer review, were revised, and have been approved for publication, but have not been published in the print journal yet. This paper discusses results from sub-millimeter wavelength observations of Io's leading and trailing hemisphere. Using these observations, the authors were able to map the distribution of three chemical species in Io's atmosphere, sulfur dioxide (SO2), sulfur monoxide (SO), and sodium chloride (NaCl). The authors then used these maps and the intensity of the observed emission lines to model the sources for these atmospheric components. For additional information beyond this summary, check out Moullet's presentation from the Harvard-Smithsonian Center for Astrophysics SMA Science Symposium 2009. 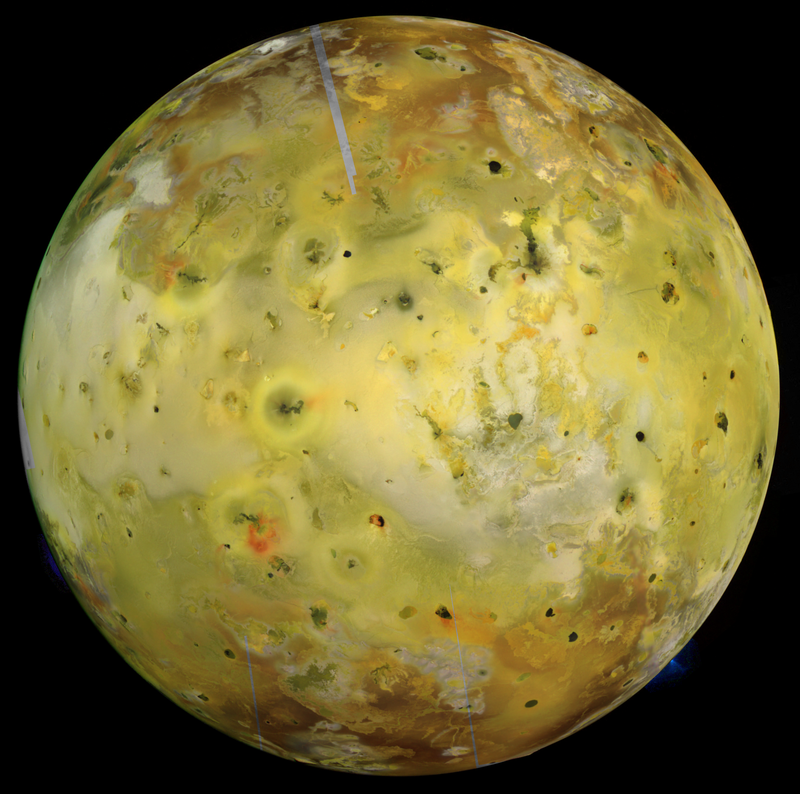 Io has a very thin atmosphere (1-10 nanobars at the surface) composed mostly of sulfur dioxide, along with its disassociation products, sulfur monoxide and atomic sulfur and oxygen. Other gases observed in Io's atmosphere or thought to exist in Io's atmosphere include sodium chloride, potassium chloride (KCl), diatomic sulfur (S2), and sulfuryl chloride (Cl2SO2). Io's atmosphere has significant density variations with time of day, being densest near the sub-solar point and thinnest on its night side, and with position on the surface. The distribution of SO2 gas was mapped across Io's surface using Hubble ultraviolet images of Io at the hydrogen Lyman-α line by Feaga et al. 2009, finding Io's sulfur dioxide gas in the atmosphere to be densest within 40 degrees of latitude from the equator and on Io's anti-Jupiter hemisphere. Adaptive optics observations at Keck in 2002 showed SO gas at several volcanic centers, which de Pater et al. 2007 suggested was related to volcanic activity. 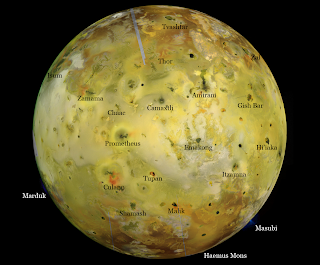 One of major questions these observations are trying to answer include identifying the dominant source of Io's atmosphere, whether it is sublimation of surface frosts, as atmospheric sulfur dioxide is thought to be in vapor-pressure equilibrium with the surface, or direct volcanic outgassing. In this new paper, Moullet et al. 2010, the authors used observations taken at the Submillimeter Array (SMA) atop Mauna Kea in Hawaii, a set of eight, 6-meter-wide radio antennas acting as a radio interferometer. The system observes at millimeter and sub-millimeter wavelengths between 0.3 and 1.7 millimeters (or frequencies between 180 and 700 GHz), at between the infrared and microwave portions of the electromagnetic spectrum. For these observations, Moullet et al. 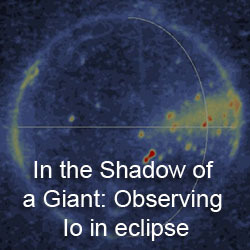 observed Io in June 2006 and July 2008 at 338 and 346 GHz, at emission bands for sulfur dioxide, sulfur monoxide, and sodium chloride. These observations were disk-resolved, allowing the authors to examine the hemispherical distribution of each gas species, and in the case of SO2 and SO, the high spectral resolution and signal-to-noise ratio allowed for more detailed analysis of their total emission. For SO2, Moullet et al. 's SMA data at 346.523 and 346.652 GHz is consistent with the results from Fegea et al. 's Lyman-α data and Spencer et al. 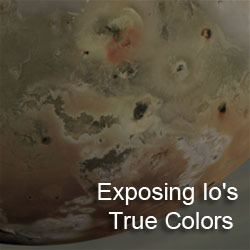 2005's infrared data, further indicating that the sulfur dioxide in Io's atmosphere is predominantly located at equatorial latitudes and Io's anti-Jovian hemisphere. Both constraints on the distribution of SO2 are similar to the distribution of sulfur dioxide frost on Io's surface and volcanic plumes. To see which source of SO2 dominates, volcanic outgassing or sublimation of surface frosts, the authors modeled the appearance of Io's 346.652 GHz SO2 line emission using a hydrostatic model of Io's sublimation atmosphere and another modeling emission purely from the volcanic plumes noted by Geissler et al. 2004. Using an appropriate number of active plumes, the authors found that volcanism does not match the distribution and shape of SO2 gas seen in the SMA data (except for the slight northward offset in emission seen over the anti-Jovian hemisphere in 2006). In addition, to match the amount of emission observed, an unrealistic number of active volcanic plumes (40-230 Prometheus-type, or 5-20 Pele-type plumes, on each hemisphere) would be required. Even if all 16 plumes noted by Geissler et al. were active, they would still only account for 5-11% of the emission on the leading side, and 13-18% on the trailing side. The hydrostatic models of the frost sublimation component of Io's SO2 atmosphere better match the distribution and emission flux seen in the SMA data. The derived SO2 column densities (an average of 2.3-4.6×1016 cm−2 for the leading hemisphere, and 0.7-1.1×1016 cm−2 for the trailing side), gas temperatures, and variations with Io's distance from the Sun provide further evidence that the main source for sulfur dioxide, the dominant component in the satellite's atmosphere, is vapor-pressure equilibrium sublimation of SO2 surface frosts. A minor fraction of the SO2 also comes from volcanic gas plumes (though not all gas emissions for volcanoes form plumes). Moullet et al. also mapped the distribution of sulfur monoxide and sodium chloride in Io's atmosphere for the first time. Both gases were predominately found on Io's anti-Jupiter hemisphere, as SO2 was. The signal-to-noise ratio for the SO data was sufficient for the authors to perform an analysis on the source of that gas, similar to the one they performed on sulfur dioxide. Two sources were considered: photolysis of SO2, when sulfur dioxide is broken up by solar ultraviolet photons into SO and O, and direct volcanic emission. In the case of volcanic activity, they found that, using a reasonable level of plume activity, volcanism is the source of 2.5% of the SO observed in the SMA data, using a model that included four volcanic plumes. Using more plumes, or Pele plumes, would result in models that was more extended spatially than the emission maps from the data acquired. Even using a favorable, 16 plume model, volcanic plumes account for 13-40% of the total SO emission, assuming a 10% mixing fraction in the plumes. This at least suggests though, that volcanism is a more significant source of sulfur monoxide than sulfur dioxide. The dominant source, however, is photolysis from SO2, as the modeling performed by Moullet et al. suggests. The authors note that the "relative contribution is not easy to assess in the absence of precise estimates on SO lifetime in the atmosphere." The signal-to-noise ratios of the NaCl maps were much lower than those for the SO2 and SO data, but radiative transfer modeling of NaCl in Io's atmosphere shows that the data is consistent with a volcanic origin. This is particularly the case since NaCl has a short lifetime in Io's atmosphere due loss from condensation on dust particles and photolysis into atomic sodium and chloride. The amount of NaCl emission observed is consistent with a lower-bound, mixing ratio in volcanic plumes of 0.6% on the trailing hemisphere, and 2.5% on the leading side, similar to thermochemical modeling done by Fegley and Zolotov 2000. Moullet et al. could not rule out other sources for the NaCl emission, such as sputtering. This paper seems to provide further evidence that most of the gases in Io's atmosphere result from the sublimation of sulfur dioxide surface frosts, with direct volcanic emission playing a minor role. Other major atmospheric components such as sulfur, oxygen, and sulfur monoxide result from the photo-disassocation of sulfur dioxide into its elemental components by solar ultraviolet photons, though a larger percentage of the sulfur monoxide in the atmosphere may come from direct volcanic outgassing. Finally, some atmospheric components not related to sulfur chemistry, such as sodium chloride, could be entirely explained by volcanic outgassing, though other sources such as sputtering are also possible, but weren't modeled by the authors as the distribution of surface deposits of minerals other than sulfur and sulfur dioxide are very poorly constrained. According to their presentation from April 2009, the authors stated they planned to map the distribution of other species such as potassium chloride, silicon oxide, and disulfur monoxide in the summer of 2009 using the APEX antenna in Chile, and will submit a proposal to observe Io's atmosphere at much higher resolution using the ALMA telescopes when they are finished in 2012.